Well, Anthony is quite busy underselling temperatures. Here's an example in a WUWT article by Tim Ball who, incidentally, doesn't share Anthony's "belief" that the greenhouse effect is real. But first - did you know that it's all a conspiracy? The IPCC "controls" national weather offices through the WMO according to Tim Ball. He does come up with the weirdest conspiracy theories, doesn't he. Someone should tell NOAA and BoM and JMA and CMA and SAWS and Roshydromet and all the worlds' weather bureaux that they are secretly under the control of the IPCC and the WMO and probably the New World Order and maybe the Lizard Men. The Intergovernmental Panel on Climate Change (IPCC) set climate research back thirty years, mostly by focusing world attention on CO2 and higher temperature. It was a classic misdirection that required planning. The IPCC was created for this purpose and pursued it relentlessly. Through the World Meteorological Organization (WMO) they controlled national weather offices so global climate policies and research funding were similarly directed. This means that all the world's nations have finally found common ground. Despite their differences in politics and world view, despite battling each other in trade wars and military conflicts they all agreed on one thing because they are under the control of the IPCC. They conspire together on climate science. Think of the rewards. Governments in democratic countries would win elections by introducing carbon taxes. That's a sure winner with voters. Then they would get elected by hoodwinking the public into thinking there have been worse heat waves and droughts and flash floods occurring more often. That way they can get votes by making taxpayers dip into their pockets and pay flood levies and build sea barriers. Voters just love politicians who raise taxes. 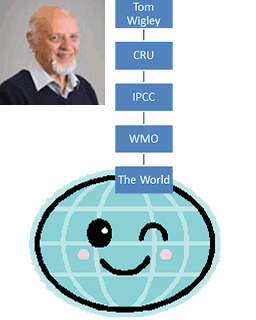 It is almost a maxim that if the people at the Climatic Research Unit (CRU), who effectively controlled IPCC science, were looking at a topic it was because it posed a threat to their predetermined hypothesis. Tim doesn't understand anomalies and baselines? Tim asks the question: "How can two major agencies HadCRUT and GISS produce such different results, supposedly from the same data set?" Over the period from 1979 to 2012 both surface and tropospheric temperatures show similar trends, which isn't surprising. The two surface records show temperatures rising at 0.16 degrees a decade (HadCRUT4 and GISTemp), while the two lower troposphere records show temperatures rising at 0.14 degrees a decade (UAH) and 0.17 degrees a decade (RSS). What about Tim's question: "How can two major agencies HadCRUT and GISS produce such different results, supposedly from the same data set?" As you can see, they don't. What might surprise some people is just how close these two temperature records are, with both of them showing temperature rising at 0.16 degrees a decade. Now it's not unexpected that they will vary on a month to month basis. They use different algorithms and to some extent different data sources. One of the more noted differences is the coverage of the Arctic. What about the "average 2002-2011" in Tim's table? I'm not sure what that's meant to demonstrate, given that global surface temperatures are rising. But just for the heck of it let's have a look. 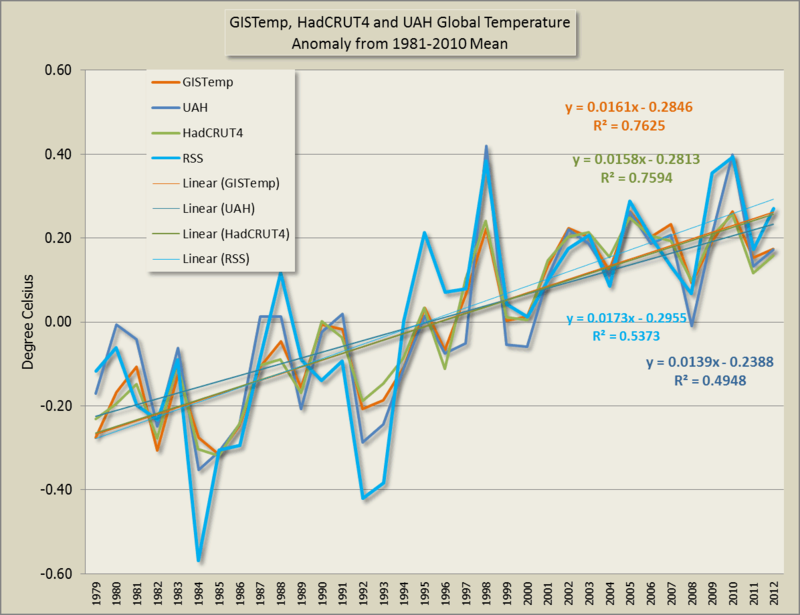 First we'll make sure the anomaly is from the same baseline, I'll use the 1981 to 2010 baseline. 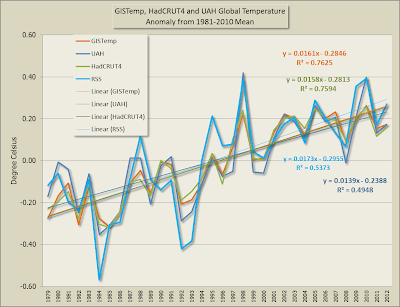 GISS and UAH differ by 0.36°C, which is enormous in nine years. Compare it to the 0.6°C increase over 140 years, a change the 2001 IPCC claimed was dramatic and unnatural. If you recalculate the anomalies from the same baseline, most of the difference between them disappears. (Newbies can see the examples here.) The data as provided has different baselines: HadCRUT4 is 1961-1990; GISTemp is 1951-1980; UAH is 1981-2010; and RSS is 1979-1998 (I think - the documentation for RSS is good in some respects but not in others). And it's worse still. 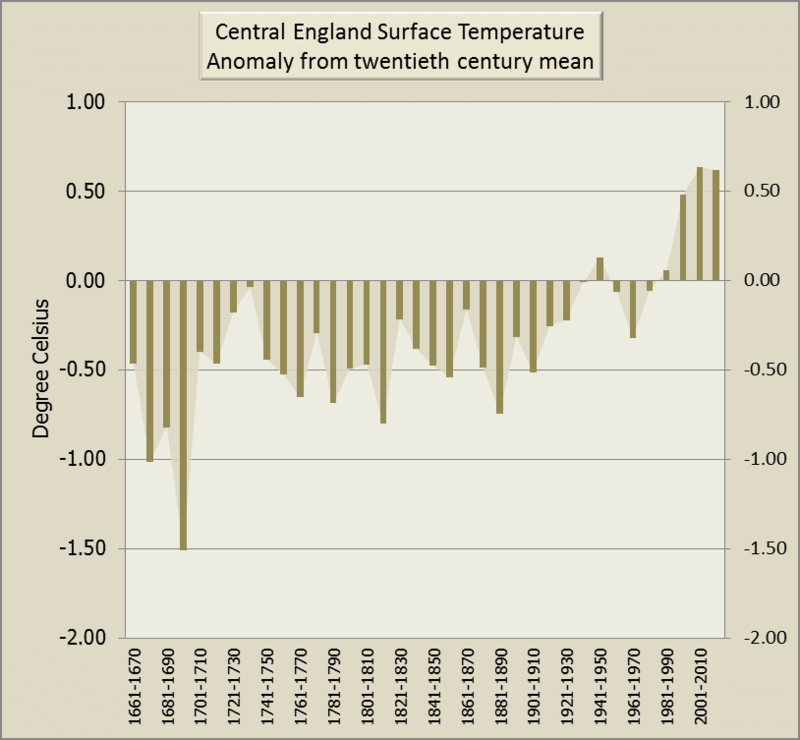 Tim Ball said: "Compare it to the 0.6°C increase over 140 years"
Have a look at the decadal chart at the top - go back 140 years to the 1870s and you'll see the temperature has risen by 0.8°C. Tim Ball has shaved about 0.2°C off the temperature rise. And not a word from the blog owner Anthony Watts. Not a single objection in the comments. I guess when there are so many errors in the one paragraph it's hard to keep up with them all. Here - you can check HadCRUT4 as well, which covers a longer period than GISTemp. The temperature anomaly has gone up from around -0.3 degrees to +0.5 degrees, or a rise of 0.8°C. Even if you just looked at central England, which is a favourite of deniers at WUWT, the temperature has gone up by a lot. 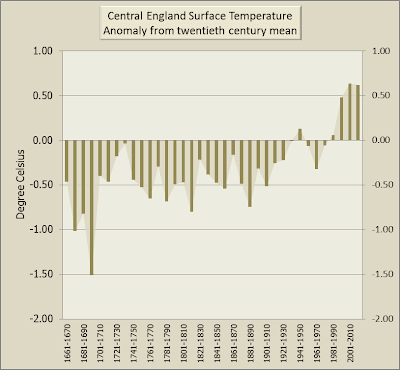 It's risen from an anomaly of around minus 0.4°C or more in the 1800s to more than +0.5°C - a rise of around 0.9°C. The point? 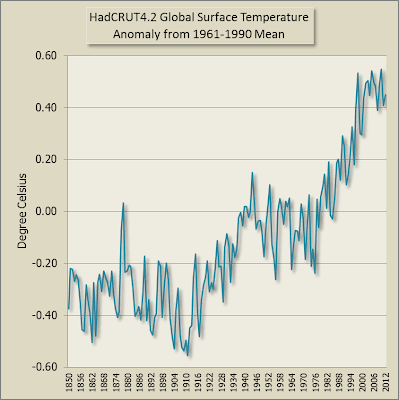 Maybe that Anthony Watts is a climate science denier! What's the point of this article? There isn't one really. Perhaps to make a snide point, I'll relate it back to the tweet at the top of the page from Anthony Watts. He objects to being called a "denier" because he accepts the greenhouse effect. 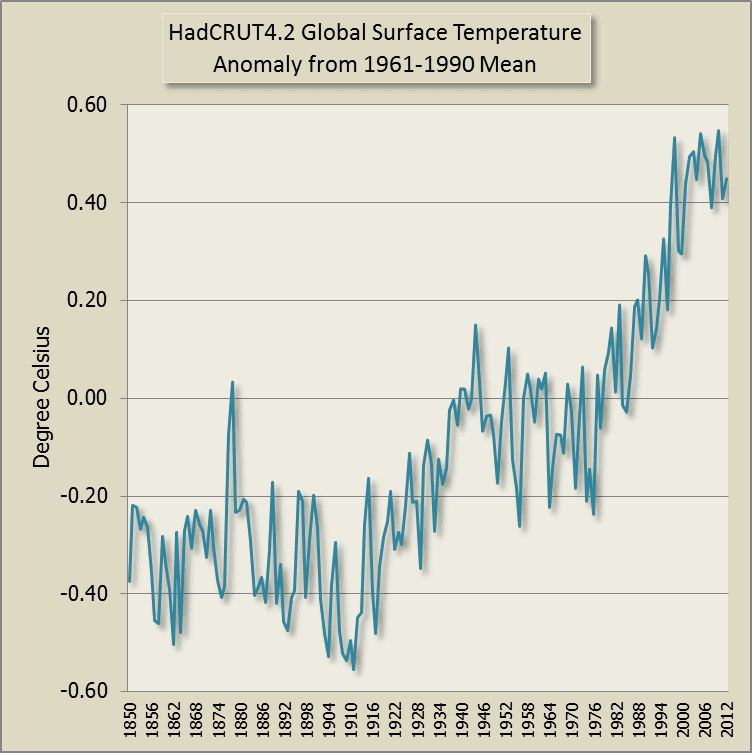 However he admits that he pushes for "temperatures being oversold". I suppose that's why he puts up article by Tim Ball, who rejects the greenhouse effect and misrepresents the temperature record. It's not the temperature that's oversold it's that Anthony Watts "undersells" the temperature record! Here are a few comments from the deluded deniers that Anthony Watts encourages at WUWT (archived here). We were told for decades the greenhouse effect would boil the planet, that at the equator it would cause unprecedented temperatures throughout the lower atmosphere and all sorts of catastrophic “stuff” was going to happen. DR next asks if the science of the greenhouse effect has changed since the late '80s and '90s. Someone might tell him - no. It's still the same. Who else remembers the myriads of magazine articles such as this and countless TV specials and news reports about how the “greenhouse effect” was going to cause heat to be “trapped” in the troposphere back in the late 80′s and 90′s……and believing it? I mean, who wouldn’t believe NASA with all them super smart scientists; they surely had to be right. Remember Mosher, this is all high school physics we were told back then. We’re still told it is basic high school physics today, but was there a new hypothesis constructed to replace the one we were indoctrinated with 25 years ago? Has the science changed? I’ve always wondered about the tree ring studies and how they are supposed to be a proxy for temperature when trees obviously will respond to changes in precipitation and CO2 concentration – probably more than temperature. I’m still reading. Compelled to say… And there are unknown knowns, the things we think we know, but actually don’t. If you lie to yourself, you can produce lots of these. Aren’t we discussing a great collective lie, and a great crumbling example of an unknown known? The WMO does not control national weather services. Funding for climate research in the U.S. is mainly from the NSF and many other major countries similar funding agencies. The idea the the WMO directs climate research funding is absurd. And the CRU does not control the IPCC. I’m afraid you all are going down the conspiracy theory path. The IPCC reports give extensive discussion of the hydrologic (water) cycle. Temperatures risen but "oversold"? What does that mean? IIRC even after Berkeley Earth he thinks the temperature increase isn't what the databases say it is? That's "overstated" not oversold. Or does he think that there's too much emphasis on temperatures? Sou, your power hierarchy is missing the topmost level - Al Gore. Ah, but "Tom Wigley" is probably an anagram of "Al Gore" when it is written in lizardman. Personally I like Motley Wig but there are some sinister anagrams in this lot. Ogle My Wit especially. I find it amusing that nothing in Willard's tweet disqualifies him from being a climate change denier as it is defined. Strange how such a supposed expert forgets what a basic term means when it suits him to do so. In his comment Felix reminds us of a very useful word - "absurd". Tim Ball, in case you're reading this and still don't get it (surprise, surprise): baselines. That level of stupidity makes me distrust a person's expertise right away. They do other stuff that make me distrust their integrity. If it were just the integrity, I'd try to look past my confirmation bias and listen to what they have to say. But the stupidity closes the case.